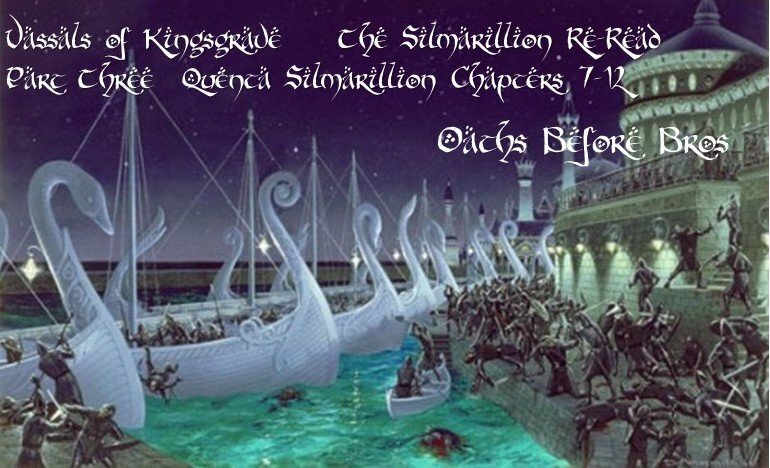 Join the Vassals of Kingsgrave for the third part of the ongoing Silmarillion re-read project. Today we recap chapters 7-12 of the Quenta Silmarillion which covers “The Silmarils and the Unrest of the Noldor” through “Of Men”. The action picks up in earnest as the light of the Two Trees are extinguished by Melkor and his giant spider, the Noldor swear a terrible oath, the Valar create the Sun and Moon, and the Dwarves (Stunted People) and Men (The Sickly) finally come into the story. Hosts Greg, Matt, Shane, Brett & Matthieu debate the dickishness of Feanor, the haughtiness of Elves in general and the unintended consequences of unbreakable oaths made in haste.